During the 2017 Wolfpack home football season, 227 campus and community volunteers participated in the Carter-Finley Composts or WE Recycle waste diversion programs. During the 2017 football season, Carter-Finley Stadium diverted 42 percent of gameday waste from landfill through recycling and composting efforts. The NC State football team’s Sept. 16 victory over Furman University wasn’t the only win in Carter-Finley Stadium that day. For the first time in the stadium’s history, more gameday waste was recycled or composted than trashed. 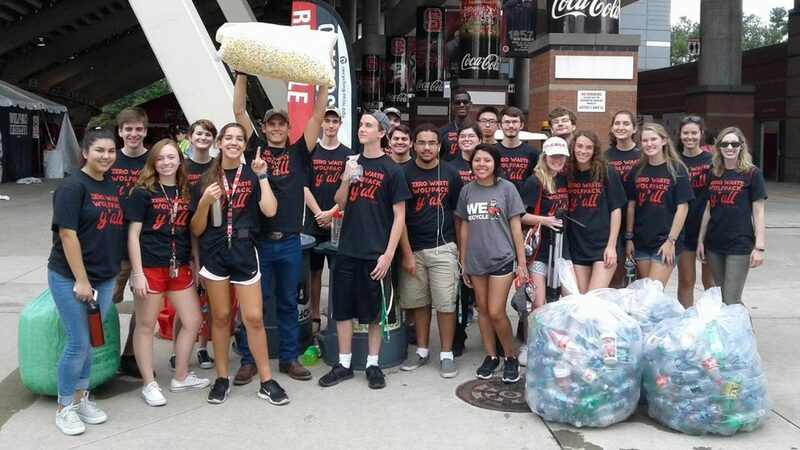 Instead of ending up in a landfill, more than 10,000 pounds of material was transformed into useful resources, leading to a 53 percent waste diversion rate for Carter-Finley Stadium. NC State’s solution is a two-pronged gameday waste reduction effort. WE Recycle promotes recycling in the tailgating lots, and Carter-Finley Composts offers composting and recycling within the stadium. While WE Recycle recently wrapped up its fifteenth season, Carter-Finley Composts is just three seasons old. That’s what makes its progress all the more impressive. At concourse-level waste stations, fans can compost leftover food and paper-based food packaging, which is transported to a composting facility. There, the material is transformed into a nutrient-rich soil amendment that’s used in gardens and landscaping. 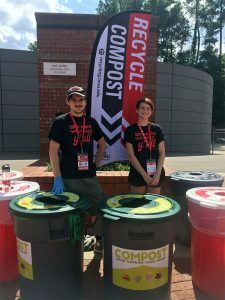 When Carter-Finley Composts launched in 2015, composting was only available on the concourse level through waste stations staffed by volunteers. 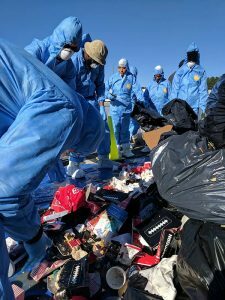 Then, in the 2016 season, workers who clean the stadium after the game began separating compostable materials from landfill items and recyclables, which were already being separated. That switch ‒ plus the start of compost collection in the Vaughn Towers’ kitchens ‒ helped nearly double the stadium’s composting rate, driving the 2016 season total to 8,920 pounds of compostable material and a 27 percent waste diversion rate. Fast forward one year, and Carter-Finley tripled its compostable material collection to nearly 28,000 pounds, which helped push the season’s average waste diversion rate to 42 percent. “Our fans are more familiar with the program and seeing volunteers managing waste stations. We also added paper towel composting bins in select restrooms. These efforts are really improving our composting and diversion rates,” St. Hill said. In 2017, Waste Reduction and Recycling worked with NC State Athletics and NC State Dining to divert more pre-game waste from deliveries and other gameday prep. Shipping pallets, paint buckets, marketing materials and more are now tracked, collected and recycled. As more compostable and recyclable materials are incorporated into stadium operations, diversion rates should increase even more. “Every year we come together and see how we can make the [waste reduction program] stronger and keep it rolling in the right direction,” said Derek Liles, facility supervisor for Carter-Finley. Volunteers conduct a waste audit on a Carter-Finley Stadium dumpster the day after a game. By sorting and analyzing the types of materials in the waste stream, Waste Reduction and Recycling staff can develop additional waste reduction strategies. According to St. Hill, the program’s strength is its people: a team of staff, student interns and volunteers that make this large-scale waste diversion effort possible. Days before each home game, waste bins are cleaned, placed, bagged and identified with signage. Student interns recruit volunteers, who manage the waste stations and ensure discarded materials are correctly sorted. On gameday, stations are placed, volunteers are trained and the collection efforts begin. After the game, it can take up to two hours to break down waste stations, collect bags and help concession vendors divert material such as cardboard and unsold food. In Vaughn Towers, chefs compost food waste and set aside unserved food for redistribution. “At the end of the game, all the leftover food that can be repurposed goes back to campus dining halls or to local community organizations through the student-led Food Recovery Network,” said Keith Smith, who directs dining operations for the stadium. Collectively, the Wolfpack’s waste reduction efforts inside the stadium and in the tailgating lots resulted in a 29 percent total diversion rate for the 2017 season. It’s a new record that St. Hill and others hope to surpass soon.